The global response to a disease that largely effects the most marginalized populations of poorer countries shows a basic lack of respect for human rights on the part of international institutions. 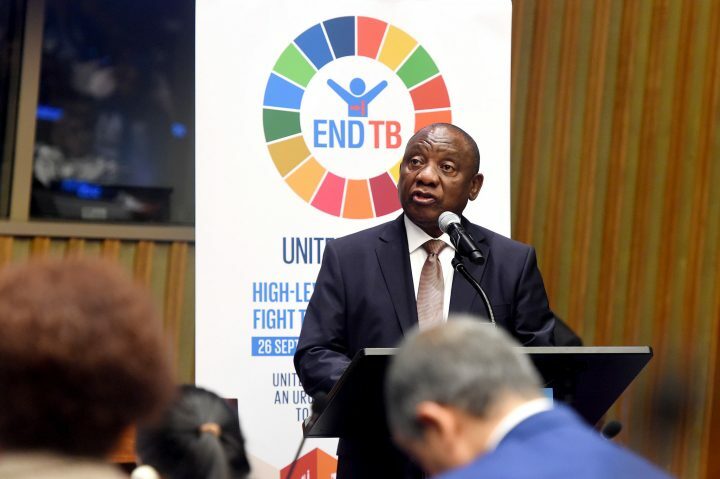 South African President, Cyril Ramaphosa, at a high level meeting on TB at the UN General Assembly in September 2018. Image credit the Government of South Africa via Flickr. On September 26, 2018, the United Nations General Assembly approved a Political Declaration that sets out the first globally coordinated response to one of the greatest public health crises of our time, tuberculosis (TB). Two days previously, the UN unveiled at its headquarters in New York a new statute of Nelson Mandela, who had TB in Cape Town’s infamous Pollsmoor Prison, a facility that has been the subject of repeated litigation for many years due to the wildly high rates of TB that persist in the prison still today. Just as homage to Madiba stands in contrast to the persistence of the rights violations he suffered and fought, so too does language that embraces human rights in the UN’s new Political Declaration stand at odds with the reality on the ground. New research on 20 of the 30 countries with the highest TB burdens shows that, more often than not, laws related to TB have little to no regard for the most basic human rights such as liberty and privacy. The truth is that the TB response has never aligned to human rights—and most countries that endorsed the new Political Declaration have not yet understood the dramatic change to law and policy needed to create a “human rights-based response” to the disease. TB kills close to 2 million people a year and almost all of those people are poor and from poor countries. TB thrives on and perpetuates poverty and inequality; it is not coincidence that 70% of the over 10 million people who fall ill with TB every year live in Africa and South East-Asia. If TB is a disease of inequality, drug-resistant TB is doubly so. New data shows that the extent of the drug-resistant TB crisis is far worse than what we once thought, with over half a million cases in 2017. The common treatment for drug-resistant TB is torture by poison; the drugs are so toxic that they leave more people with psychosis and disabilities, like permanent hearing loss, than they cure. The treatment takes two years and many people spend much or all of that time in mandatory isolation. Despite this data, only two new TB drugs have come to market in the last 50 years and patents, high prices, and slow policy change hamstring access to them. To date under 30,000 people in total have received the drugs, compare that to the more than 500,000 people who get drug-resistant TB every year. As many as 83% of households affected by drug-resistant TB suffer “catastrophic expenditure,” meaning they lose at least 20% of their annual household income—further entrenching the poverty that rendered them vulnerable to TB in the first place. And, after all that, the prevailing treatment only works about half of the time. Hence, it is undeniable that efforts to eradicate TB have been a complete and shameful failure. While the World Health Organization plans to “End TB” by 2030, evidence shows that we will only get there by 2182 at the current pace. Hope is powerful, but it should be distinguished from delusion. Paradoxically, TB isn’t the most complicated infectious disease. In fact, it’s preventable and for the most part curable. The failure of the world’s TB response stems largely from a misguided loyalty to old tactics that have remained essentially unchanged since the discovery of the first TB treatment in the 1940s. These tactics were first imagined and touted by scientists and doctors then embraced by the World Health Organization and governments. For example, the WHO continues to champion a failed strategy known as Directly Observed Treatment, which requires people to travel to a clinic or hospital every day in order for a health authority to watch them swallow their pills. Because TB affects the poor, people often travel long distances by foot and then waiting in long queues at the clinic. Such paternalism and disregard for autonomy is rare in most of modern medicine yet the prevailing norm for TB. International funders working on TB such as the Bill and Malinda Gates Foundation and the Global Fund to Fight AIDS, TB and Malaria continue to focus primarily on interventions that are purely biomedical—well under 1% of TB funding from the Global Fund, for example, goes to addressing human rights issues. This is colonial thinking—it imagines the problems of the poor as simple, like the poor themselves. This type of thinking and the policies it births define the “public health approach” that has driven the TB response for decades. But it is precisely this approach that has failed because it has never recognized that the “public” is made up of people with human needs, emotions, and rights. Our guiding angels cannot be clad in hazmat suits and neither will salvation fall from the heavens in the form of a messianic biomedical intervention. Real progress in the fight against TB requires that we think of people with TB as people. Such thinking leads to focus on law and policy reform to create health systems that foster trust and dignity rather than fear. This is why only human rights can chart a successful response to TB. In most countries, from Bangladesh to Zimbabwe, TB-related public health laws are a cruel matrix of radical police powers, incentives to fear the healthcare system, criminalization of conduct that cannot reasonably be avoided, and obligations to turn over to the state family members suspected of having TB. For example, some of these laws give health officials essentially unconstrained powers to detain and isolate people for indefinite periods without a hearing in the name of preventing TB transmission. They also empower officials to enter and search homes and then medically examine people in those homes without their consent. It is entirely reasonable to fear and hide from a public health system that takes away rights without cause or due process and then subjects people to nightmarish medical treatment that is as likely to fail as it is to work. We shouldn’t be surprised these conditions foster a culture of secrecy that drives TB underground where the system is unable to reach it. TB is a human problem and for too long the fight against it has been inhumane. The September 26 announcement of the United Nations Political Declaration on TB is a major development in the global response to the deadliest infectious disease. The UN’s Political Declaration should mark a turning point in the global TB response. But if the new era is to be effective, we need radical action to align TB-related laws to basic human rights. This means that funding should support urgent law and policy reform to do away with failed strategies like Directly Observed Treatment and to introduce protections for basic rights like liberty, privacy, and dignity in order to create humane health systems that cultivate trust and hope rather than fear.